It doesn't get much bigger than this, as the Premier League Champs the past three seasons finally reveal their new home shirt for the 09/10 campaign. This awesome new jersey has a chevron chest with matching collar - a unique stylish touch for one of the true giants of World Soccer! 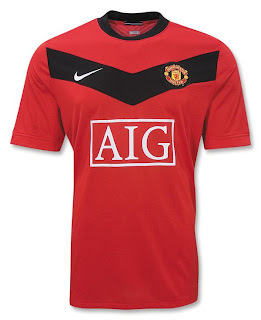 The shirt features the embroidered Manchester United team badge over your heart, and Nike's swoosh logo at right chest; a tag at side seam reads "The Theatre of Dreams since 1910." Mesh panels also give the shirt added comfort. Finally, it's created with Nike’s advanced Dri-FIT® fabric, which keeps you drier, cooler and lighter by drawing sweat from the body to the fabric’s surface, while its three-dimensional construction gives more air space around the skin to reduce clinging. Want to Play in Zhero Gravity?